First unveiled at EICMA in November 2018, Ducati is all set to bring the Hypermotard 950 to India later this year. Here are a few things you should know about the third-generation model . . .
Powertrain Updates: When the Ducati Hypermotard first took birth, it came with the heart of the Monster 1100. And the tradition of fitting the manic-monster (pun intended) motor continued. It was only in 2016 that the Hypermotard switched from using a Monster motor to a Multistrada mill. The 2019 Ducati Hypermotard continues with the same engine as the model it replaces – a 937cc liquid-cooled L-twin – but it has now been re-tuned to pump out 4 more horses and an additional 1Nm. It now makes 114bhp and 96Nm. Interestingly, Ducati says that 82 per cent of this torque is on offer at just 3,000rpm and 88 per cent of it between 5,000rpm and 9,500rpm. Other changes to the motor include new pistons, cam profiles and a larger 53mm throttle body. 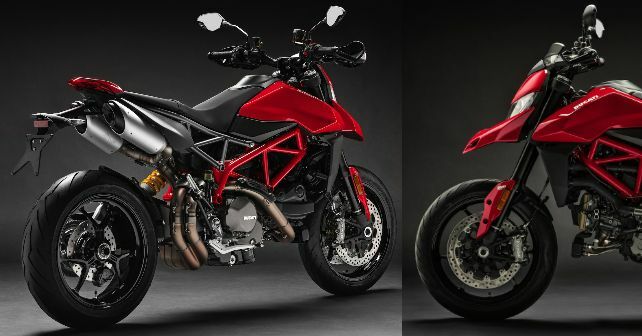 Other Changes: Look at the 2019 Hypermotard from a distance, and you may not be able to tell it apart from the model it replaces, except for a few differences. This latest iteration gets a twin underseat exhaust, wider handlebar and a flatter seat. The motorcycle itself is narrower too, which essentially results in a narrower seat than before. This should enhance the comfort for shorter riders, and they may now be able to get their feet on the ground. Just like all the new-age motorcycles, the 2019 Hypermotard gets a 4.3-inch TFT screen that offers a truckload of information. Weight Savings: In this 2019 iteration, Ducati has managed to shed some 3.6 kilos over its predecessor. While it may not seem like a substantial reduction, remember that the Hypermotard, in all its generations, has been an extremely light offering, to begin with. Marginal weight reductions have been made to the chassis, engine and a few other components. Electronics Package: There are a lot of electronic aids for your assistance here. It has three riding modes: Sport, Touring and Urban. Sport mode is the most aggressive and gives you the option of manually mellowing down ABS intrusion to level 1. Touring mode also allows you to extract all 114 horses but with marginally softer throttle response, maximum support from the traction control, wheelie control and ABS. Switching to the Urban mode gives you access to just 75bhp and turns up all aids to the maximum. This mode also doubles up as a rain mode. Internationally, the Hypermotard is available in two trims – standard and SP. The standard model comes in the Ducati Red shade, while the SP comes in red and white dual tone. Ducati will bring the Hypermotard to India in a few months’ time. Expect it to demand a premium over the outgoing model.